A frontline Pro-democracy Organization- Human Rights Writers Association of Nigeria (HURIWA) has condemned as a grave crime against humanity, the killings of pro-Biafra peaceful demonstrators in major towns of the South East and South/South by security forces. HURIWA alleged that soldiers and police witjout provocation shot live bullets into crowds of totally unarmed and peaceful members of the Indigenous People of Biafra (IPOB) and the Movement for the Actualization of Supreme State of Biafra (MASSOB). 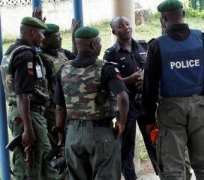 Warning that the incessant and serial killings of unarmed Igbo supporters of the Indigenous People of Biafra (IPOB) and Movement for the Actualization of Supreme State of Biafra (MASSOB) have grave global implications of graphically depicting the Nigerian government as tyrannical and despotic, the group has called for the arrest and prosecution of the armed security agents who killed the peaceful demonstrators. The Rights group said it was absolutely illegal for the Federal Government to use the force state sponsored blood cuddling violence to compel the youth in the South East and parts of South/South not to hold solemn peaceful marches and other commemorative events to mark the anniversary of the declaration of the now defunct state of Biafra. "How can this government deploy firearms and weapons of mass death to cajole and force people to stop holding these harmless anniversary events when this same government declared a full day of public holiday to mark the democracy day which is the day civilian rule returned to Nigeria and military coupists were sent back to the military barracks to remain loyal constitutionally to democratic administration? The killings of these persons marking the Biafra anniversary is a grave crime against humanity which must be investigated and the killers in military uniforms identified, arrested and prosecuted ". HURIWAstated that from available empirical data, over 35 peaceful demonstrators were killed on May 30th, 2016 by armed security forces comprising soldiers and police in the streets of Onitsha in Anambra State, Asaba in Delta State and Umuahia in Abia Statesimply because these demonstrators were out to commemorate the May 30thdeclaration of the Republic of Biafra in 1967. HURIWA specifically alleged that the General Officer Commanding 82 Division of the Nigeria Army Major General I. Attahiru and the state commissioners of police in Delta, Anambra, Enugu, Ebonyi and Abia States must be prosecuted for authorising the unlawful killings of unarmed civilian Pro-Biafra demonstrators. HURIWA lamented that the National Human Rights Commission undress the current management has become complicit in the despicable acts of wanton breaches of the fundamental human rights of the Nigerian people by security forces. In a statement jointly signed by the National Coordinator Comrade Emmanuel Onwubikoand the National Public Affairs Director Miss Zainab Yusuf said the recent killings have added to the previously recorded high toll of causalities from the reckless and unconstitutional deployment of brute force by armed security forces in their primitive attempts to stop people from enjoying their right to peaceful assembly. The Rights group is already compiling damaging evidence of crimes against civilians by armed security forces for Onward transmission to the International Criminal Court in The Hague Netherlands so specific indicted public officers are prosecuted for crimes against humanity soon. HURIWA also strongly appealed to the National Assembly of Nigeria under the chairmanship of Senate President Senator Bukola Saraki, the African Union and the United Nations to compel President Muhammadu Buhari to stop forthwith the impunity of deploying armed security forces to kill peaceful demonstrators in the South East. HURIWA also Condemned the governors of the five South East States and the South East elected Political leaders for their collective cowardice in the face of these calculated pogroms against the unarmed citizens of the South East by the current Federal government using security forces who are funded by the tax payers to unleash violence on persons whose only reason for been killed was their determination to exercise their Constitutionally protected Rights to peaceful assembly and freedom of speech enshrined in the Chapter Four of the 1999 Constitution as amended.